The water pouring from spigots on the wetlands boxes into buckets below ranges from almost clear to molasses brown. Each group of students is measuring how tap water is affected when filtered through the constructed wetlands system. Tests will determine pH, turbidity, phosphorus and nitrogen levels and other variables. Through those tests, the students can begin to assess the effectiveness of their wetlands design. One goal of the lab is for students to understand the science behind the water-treatment system of the 17,000-square-foot R. W. Kern Center, which is under construction on campus and scheduled to open in the spring. A series of wetlands will be among the ways blackwater and greywater from the Kern Center, designed to be a “net zero” energy, water, and waste building, will be treated. The lab and subsequent analysis of data will give students hands-on insight into the ways different materials, such as plants, soils, and microbes, combine to purify water. 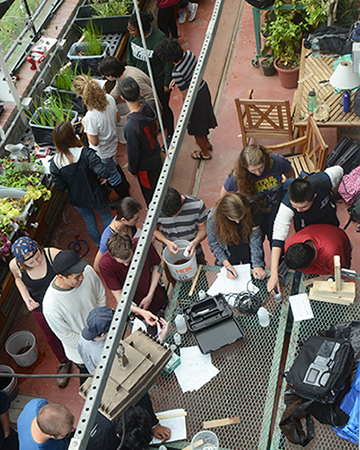 The Kern tutorials engage first-year students in a series of labs that focus on water, microbes, and mathematical models to demonstrate processes occurring in the living building. The tutorial professors—Tor, Sarah Hews, Christina Cianfrani, and Seeta Sistla—have designed the labs so students will be teaching their classmates how to conduct each one. For the water lab, the group leaders were from Cianfrani’s and Sistla’s tutorial Where Does the Water Go? Water, Carbon, and Nutrient Flow in a Living Building. First-year student Hannah Hidder, one of the group leaders, says class discussion and homework on topics such as water quality, greywater reuse, and differences between constructed and natural wetlands were good preparation for the lab. She and her classmates had toured the Kern Center for the first time two weeks earlier, and many said seeing the different aspects of the building provided a deeper understanding of what they were learning in class. “It was helpful seeing the building in person, especially the parts that had to do with the rain gardens and the cisterns used for gathering rainwater,” Hannah says.